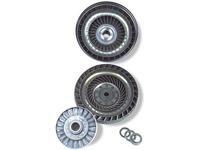 B&M Torkmaster 2400 Torque Converters are similar in performance characteristics to the Holeshot series, the Tork Master is B&M's lowest cost performance torque converter. The Tork Master is an excellent all-around performance street converter. The Tork Master torque converter is not recommended for big block or supercharged applications. GM 84-91 TH-700-R4 ( 7 ) 30 spline.